During his military service, the young Camoin was stationed in Aix-en-Provence, and was thus able to visit Cézanne, which he did assiduously for three months in 1902. That was the beginning of a close friendship and a written correspondence, maintained until Cézanne's death, the pages of which Camoin treasured for the rest of his life. In 1904 Cézanne's influence was still very visible in Camoin's painting. But the following year, in 1905, Camoin joined the Fauves, exhibiting with them in the Salon d'Automne, together with Matisse and Marquet (whom he had met some years earlier as a fellow student in the studio of Gustave Moreau), as well as Manguin, Puy, Derain and Vlaminck, among others. Most of these painters spent lengthy periods in Provence, in the area that included L'Estaque, Cassis and Saint-Tropez. 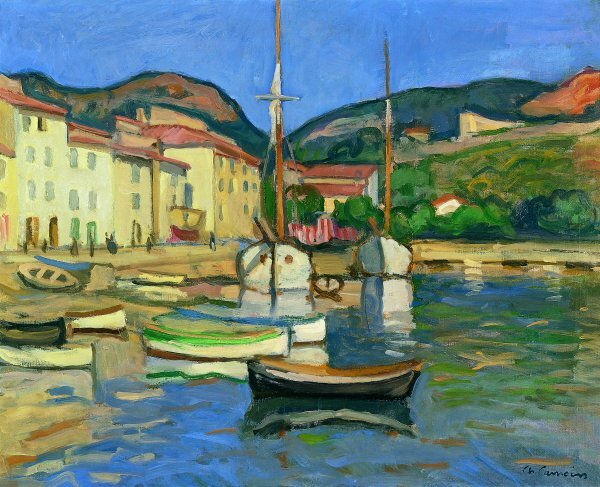 Early in June 1905, Camoin joined his friend Marquet in Saint-Tropez. On 28 June he wrote to Matisse: "We are happy to learn of your good news and know that you are more or less satisfied with your work. Here, at least as far as I am concerned, I cannot say the same. I have spent the last few days in Cassis and have not done more than a single canvas. I came to Saint-Tropez with the aim of recuperating, and we spend the time here sucking straws and waiting for the sun." In the secluded, intimate atmosphere of this little harbour on the Côte d'Azur, Camoin intoned a hymn to the light of the Mediterranean. The painter was a very moderate Fauve; only using combinations of intense colours for certain specific motifs, such as the dress of a young Neapolitan woman or a street festooned with flags. Like Marquet, he preferred to represent light through extensive use of white in his colours. In some areas of the paintings (for example, the mountains), we still see something of the legacy of cloisonnism, with flat areas of colour enclosed within dark outlines. In contrast, the loose brushstrokes of the reflections in the water reveal the painter's indebtedness to the Impressionist tradition. But this free handling is enclosed within a strict classical composition, defined by the masts of the boats (one of which also coincides with a valley in the profile of the mountains) and the horizontal line of the edge of the landing-stage.